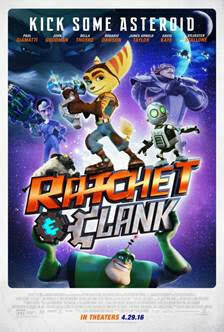 Do you want to see RATCHET & CLANK before it hits theaters? Click HERE and enter your information into the Google Doc for your chance to win a family four pack of passes for an advance screening on Saturday, April 23rd at 10:00AM in Sandy. Entry deadline will be Thursday, April 21st and winners will be notified before noon on that Friday. RATCHET & CLANK opens in Salt Lake City on April 29th.